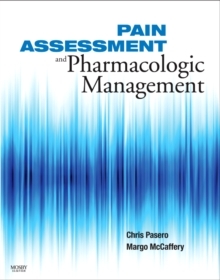 Pain Assessment and Pharmacologic Management, by highly renowned authors Chris Pasero and Margo McCaffery, is destined to become the definitive resource in pain management in adults. It provides numerous reproducible tables, boxes, and figures that can be used in clinical practice, and emphasizes the benefits of a multimodal analgesic approach throughout. In addition, Patient Medication Information forms for the most commonly used medications in each analgesic group can be copied and given to patients. This title is an excellent resource for nurses to become certified in pain management. Presents best practices and evidence-based guidelines for assessing and managing pain most effectively with the latest medications and drug regimens. Features detailed, step-by-step guidance on effective pain assessment to help nurses appropriately evaluate pain for each patient during routine assessments. Provides reproducible tables, boxes, and figures that can be used in clinical practice. Contains Patient Medication Information forms for the most commonly used medications in each analgesic group, to be copied and given to patients. Offers the authors' world-renowned expertise in five sections: Underlying Mechanisms of Pain and the Pathophysiology of Neuropathic Pain includes figures that clearly illustrate nociception and classification of pain by inferred pathology. Assessment includes tools to assess patients who can report their pain as well as those who are nonverbal, such as the cognitively impaired and critically ill patients. Several pain-rating scales are translated in over 20 languages. Nonnopioids includes indications for using acetaminophen or NSAIDs, and the prevention and treatment of adverse effects. Opioids includes guidelines for opioid drug selection and routes of administration, and the prevention and treatment of adverse effects. Adjuvant Analgesics presents different types of adjuvant analgesics for a variety of pain types, including persistent (chronic) pain, acute pain, neuropathic pain, and bone pain. Prevention and treatment of adverse effects is also covered. Includes helpful Appendices that provide website resources and suggestions for the use of opioid agreements and for incorporating pain documentation into the electronic medical record. Covers patients from young adults to frail older adults. Provides evidence-based, practical guidance on planning and implementing pain management in accordance with current TJC guidelines and best practices. Includes illustrations to clarify concepts and processes such as the mechanisms of action for pain medications. Features spiral binding to facilitate quick reference.